Most days if you were to ask me if I like my job I would without hesitation tell you, of course I love my job. I have the best job in the world, I get to eat food for a living (well more or less :). Then there are those days where I’m working on a recipe and things just aren’t going my way. I’m very picky about the recipes I post (my husband would probably say, annoyingly picky), if I don’t approve of a recipe I don’t post it. I don’t want my name slapped across a bad product after all :). I’m happy to say, finally, with the third batch and minor tweaks between each one, these came out to be exactly what I was looking for. 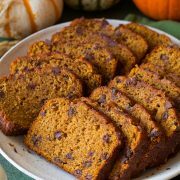 With plenty of gingery goodness, a soft and moist texture and just the right amount of deep molasses flavor to go along with the sugar ratio. I played around with different amounts of molasses, different levels of the leavening agents (more/less baking soda or baking powder), different types and amounts of fats, different levels of liquid (and types) and even the amounts of the spices were adjusted each time. Making recipes is so fun but can also be challenging when it comes to baking (if you are ever interested in learning more about baking and the sciences behind it, I’d highly recommend the book Bakewise by Shirley O. Corriher. I love that book). These are perfect for the upcoming season. I couldn’t decide if gingerbread was more of a Christmas season kind of thing or if it would land in the Fall category too. I’m going to say it could fit into Fall. 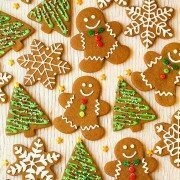 If not who cares :), I like gingerbread all year long (besides, the holidays are just around the corner). 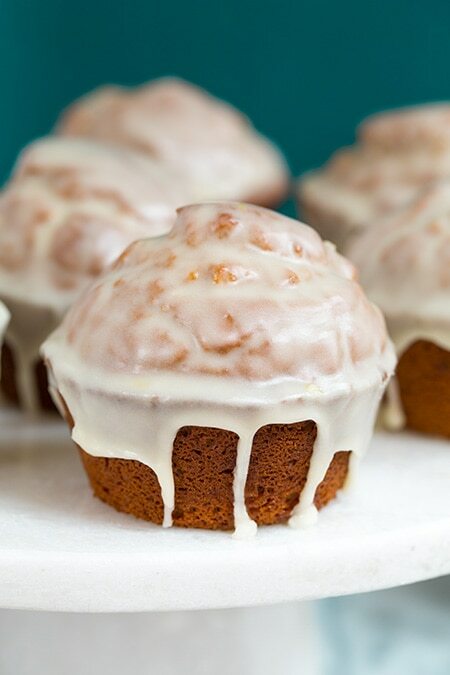 And these taste just like those cute little gingerbread cookies in glazed doughnut muffin form. Enjoy! 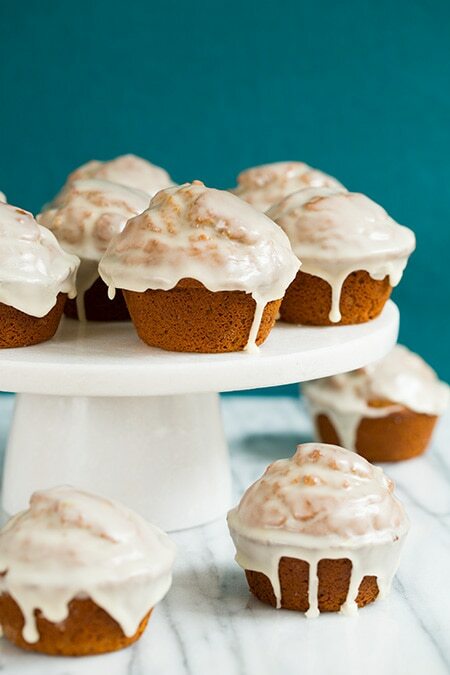 A dreamy muffin with gingerbread flavor and a sweet tempting glaze. Preheat oven to 400 degrees and butter a 12-hole muffin tin. In a mixing bowl, whisk together flour, baking powder, baking soda, salt, ginger, cinnamon and nutmeg for 30 seconds, set aside. 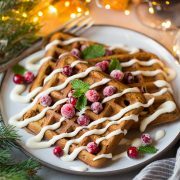 In the bowl of an electric stand mixer fitted with the paddle attachment, whip brown sugar with butter, 1 Tbsp vegetable oil and the orange zest on medium-high speed until mixture becomes pale and fluffy. Blend in remaining 3 Tbsp vegetable oil and the applesauce. Add in eggs one at a time and mix just until combined after each addition while adding in 1 tsp vanilla with second egg. Stir in molasses. Add 1/3 of the flour mixture and fold into batter with a rubber spatula, while scraping sides and bottom of bowl (don't over-mix, batter should be lumpy and a few streaks of flour are fine before going on to next addition) then add 1/2 of the milk and fold just until nearly combined, then repeat process and end mixing in last 1/3 of the flour mixture and fold just until until combined (batter should be lumpy). Divide batter among 12 prepared muffin cups, filling each well nearly full. Bake in preheated oven 8 minutes then reduce oven temperture to 375 and continue to bake 8 - 11 minutes longer until toothpick inserted into center comes out with a few moist crumbs attached. Remove from oven and run a knife around muffins to remove and transfer to a wire rack to cool slightly (I also transferred the muffins on cooling rack to a cool microwave to seal in some moisture while they cool). 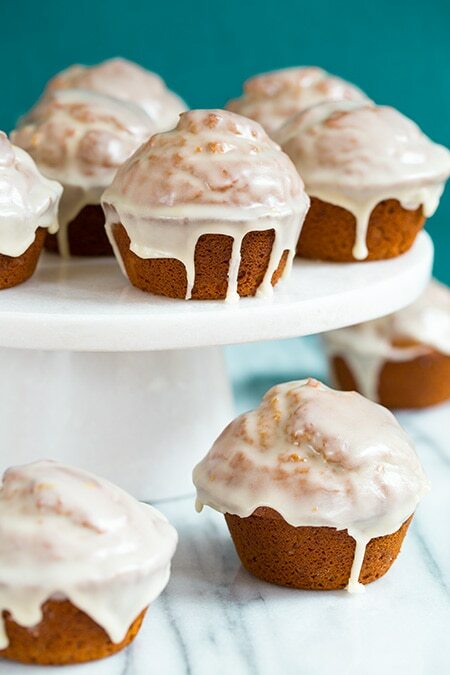 When muffins are slightly warm, dip into glaze or spread over tops, then return to cooling rack and allow glaze to set at room temperature. Store in an airtight container. 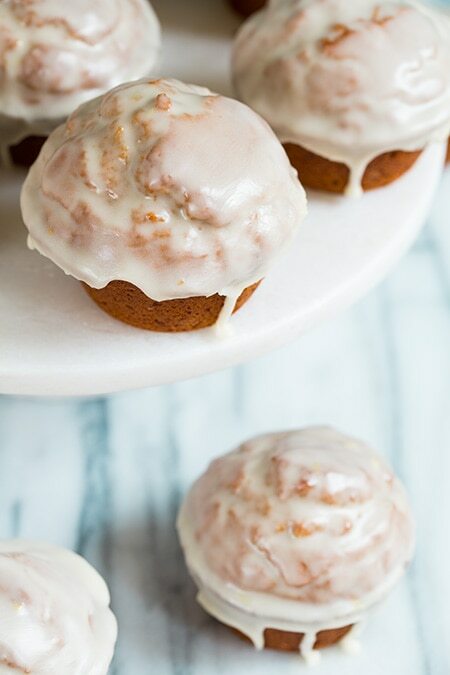 In a mixing bowl, whisk together powdered sugar, vanilla and enough orange juice to make a smooth glaze.